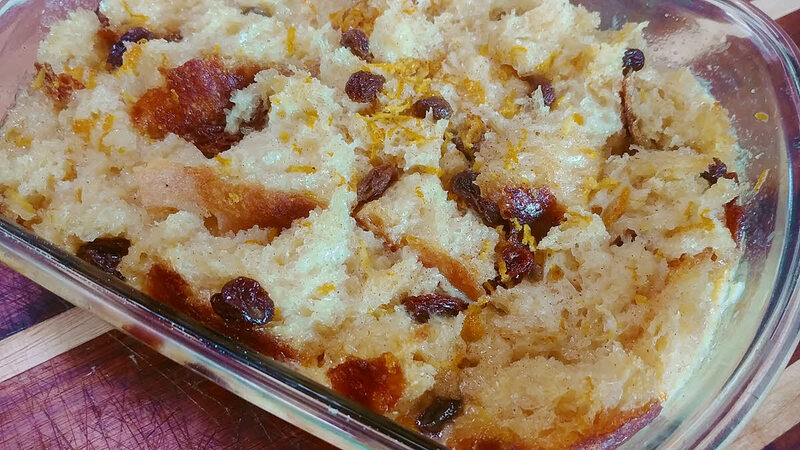 Sweet Bread pudding is the ultimate comfort food. It is also the perfect use of the day-old bread you have left over. Slightly stale bread absorbs the custard better without getting too mushy. In a large mixing bowl, whisk together the egg yolks, sugar, half and half, rum, vanilla, nutmeg, cinnamon and zest until well combined. If you don’t have half and half, you can replace it with half milk and half cream. Break the bread in bite size pieces and arrange it in an 8 x 12 x 2 inch baking dish. Sprinkle the raisins over the bread, if using. Pour the custard over the bread. Let is sit for 10 minutes. You may have to push the bread into the custard to guarantee no bread remains dry. Cover loosely with aluminum foil and poke a few holes on top for steam to escape. Place on the center rack. Bake for about an hour or till the center is firm. Remove from the oven and allow to stand for 10 minutes. Sweet Bread Pudding is ready. Serve it warm. You could even sprinkle toasted pecan along with raisins.